What Does Divorce Have to Do With The Creature From The Black Lagoon? If you are facing a divorce you may be experiencing feelings of sadness, guilt, anger, betrayal, fear, confusion, and worry about your children and your finances. You may be dreading a high conflict, long and costly court proceeding. While the end of your relationship may be inevitable, if you prefer to transition in a way that does not leave long standing bitterness, you may want to explore Collaborative Divorce. 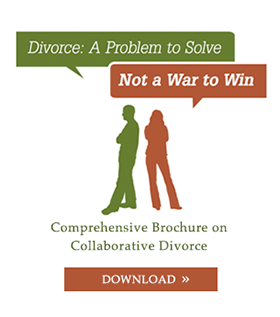 The basic components of Collaborative Divorce are a pledge not to go to court, an honest exchange of information by both spouses, and a solution that takes into account the highest priorities of both spouses and their children. And, although each case is unique, because Collaborative Divorce is more efficient and eliminates protracted court hearings, it may cost less than a tradition divorce. When you choose Collaborative Divorce a team of professionals is assembled especially for your family. You will each have both a collaborative attorney and a divorce coach (mental health professional) to advise and support you through the entire process. The team will also include a neutral financial specialist and where appropriate, a neutral child specialist. All team members have had special training, which they will use to guide and support you through the difficult transition of reshaping the family into two new households. Why does it work? Believe it or not, there is a scientific reason why people behave so badly when they are getting divorced. Here’s how it works. When our ancestors were climbing out of the primordial swamp (aka the black lagoon) our primitive brain developed with a strong instinct for self-preservation, which told us when to fight, flee, or play dead. As we developed into our current human form our brains became much more developed and complex, but we maintained that original, “reptilian” brain with its fight or flight mechanism. It is that part of our brain that becomes engaged when we feel threatened, for example during a divorce. When we feel threatened our instincts take over and often we retaliate. And when our self-preservation instinct, or reptilian brain, is engaged, it stops the more highly functioning part of our brain from helping us to act more rationally. We are prevented from accessing and using the part that is able to “rise above it”. We can’t use reasoning and judgment. The Collaborative Divorce process, with its use of the professional team, helps both parties to disengage their fight or flight mechanisms, and to use more highly functioning parts of their brain. It encourages the participants to have respectful discussions, engage in problem solving, look to the future, compromise, and develop creative solutions.